I have a number of hobbies. Currently computers and programming consume the major part of my free time. I am also interested in wood working and metal working. The cottage was my largest project. It took over two years of weekends and vacation time to complete it. It is a 800 sq. 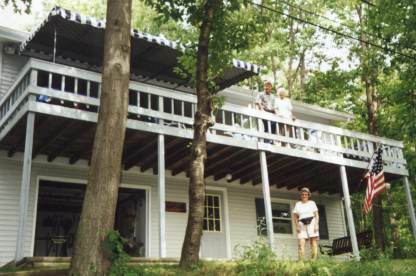 foot ranch with a full basement built in to the side of a hill. This gives the impression, from the front, of a two story house. The house was built as a year-a-round home. That is, it is fully insulated with baseboard heat. A couple of years back, while helping one of the daughters install a ceramic tile kitchen floor, I decide that scribing and snapping tiles was not the way to go (she could do it better that I could). 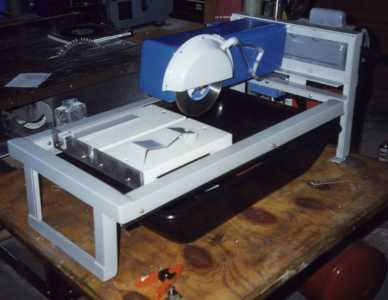 After looking at commercial wet diamond saws, I decide that I could build one. I had a spare motor and I thought "The rest should be easy" - boy was I wrong. I did manage to solve the problem of the frame warping when I welded it together. I am happy with the final outcome. This photo is of a changing table I built for one of the grandsons. 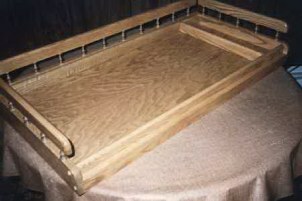 It was intended to fit over the top of a small chest of drawers and provide a place to change a baby. 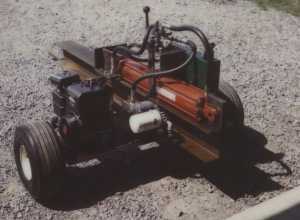 The log splitter was one of my first metal working projects. We have about 16 acres of hard woods behind the house and thought that we would burn wood to save some money. This project went well. The finished splitter will produce over 25,000 pounds of splitting force.